The year is coming to a close, and that means that it's almost time for the annual LMBC New Years Day ride. Where: Meet in the parking lot just north of the levee at 2nd (Mass St) and Locust. This ride is suitable for riders of all abilities. We'll begin by riding the levee to the Lawrence River Trail, where you're welcome to ride as much or as little of the 9-mile trail as you like. The ride will be followed by refreshments at Johnny's Tavern. We'll be riding, rain, sleet, snow, or cold, so bring appropriate clothing for the weather. Have a Merry Christmas, and I hope to see all of you there to kick off a Happy New Year! The 2013 Cyclo-cross season is past the half-way point. Only a few more events left on the calendar before the State Championships in December. Luckily for some the season will continue on into January. 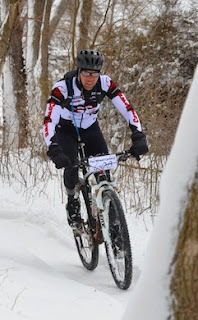 Maybe we will even get a few snowy cross races like last year. A sign that cyclo-cross has moved into a different stage of its life cycle, most event turnouts are lower overall than years past especially in the Beginner categories. USA Cycling added a Cat 5 division but it appears our area does not need to separate the Cat 4/5 division in most cases. The beginners were once the largest division. That honor now belongs to the Masters. 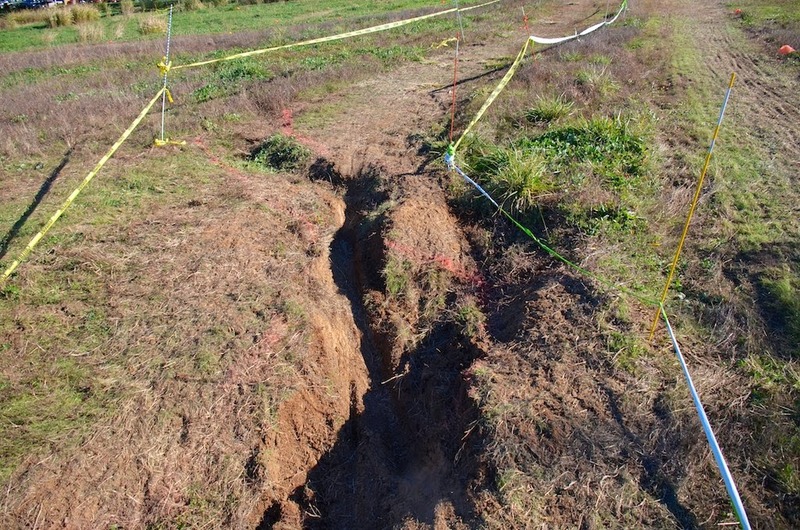 Most of the local events have enjoyed strong support from the maturing cyclocross community. The passion from this group of riders have kept the two-a-week races going with many racing twice weekly. New venues with features like the above are showing up with more regularity. Could these venues and the experience that they provide be turning away the beginners? I know my bad back can only take some many of these rough courses. 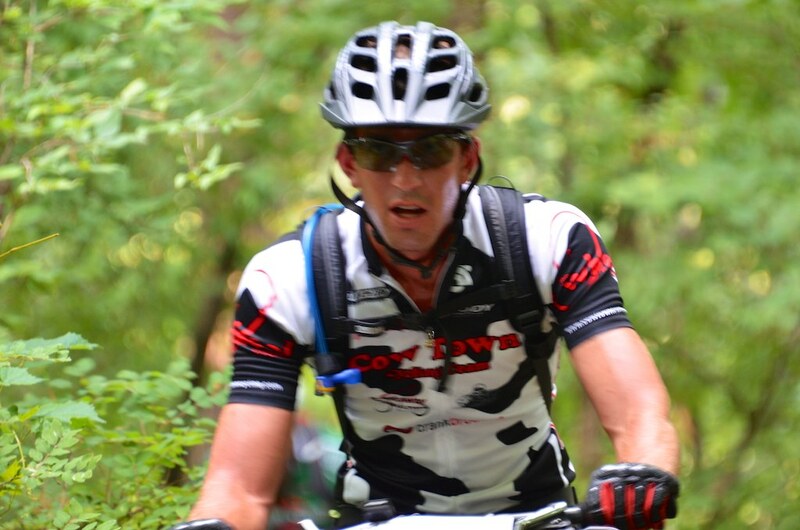 David Wathen been our most passionate rider. Dave has recently started getting good results after a slow start to the season. He has his stable of cross rigs all tuned up and ready for battle the remainder of the season. Gerard Arantowics makes a return to racing cross after a 10 year break. A 4th place at last weekends event showed he still has a passion for racing. 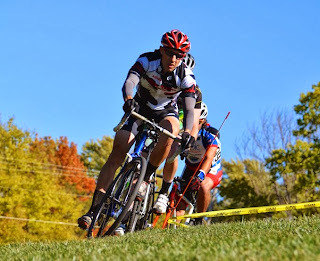 Another ride who made a return to cyclocross this year was former De Stad Cyclocross Van Kansas Champion Doug Stone. A 5 year break did not slow down Doug much as he has turned in some very good results. Constant podium finishes shows his form improving just in time for the Championships. Damian Almanza even made an appearance at a local event. 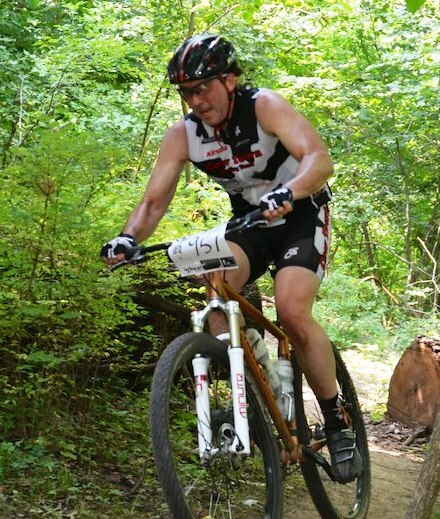 Look for the always stylish Damian to bring out his vintage cross rig at some local Shawnee events. Once a true cross addict, even this guy made an appearance. That Ritchey Swiss Cross sure is a sweet ride. Someone needs to take this ride away from this throttle twister and do that bike justice. While the MTB season has finished up and it cyclocross season here in the Midwest, our members of the Florida division of Cow Town are still enjoying some warm weather and finishing up on their Triathlon season with the Ironman Florida. 2700 triathletes participated Saturday's Ironman Florida race. Participants enjoyed a 2.4 mile swim in the emerald Gulf of Mexico waters. Next up was a flat and fast 112 mile bike ride where the absence of hills forces a consistent pacing and offers no time to recover. The final leg is a 26.2 mile run which included the scenic St. Andrew's State Park. Congratulations to Cow Town own Phil (aka Philthy) Carter who overcame a tore cartilage in his knee to finish the Florida Ironman in 13:33. 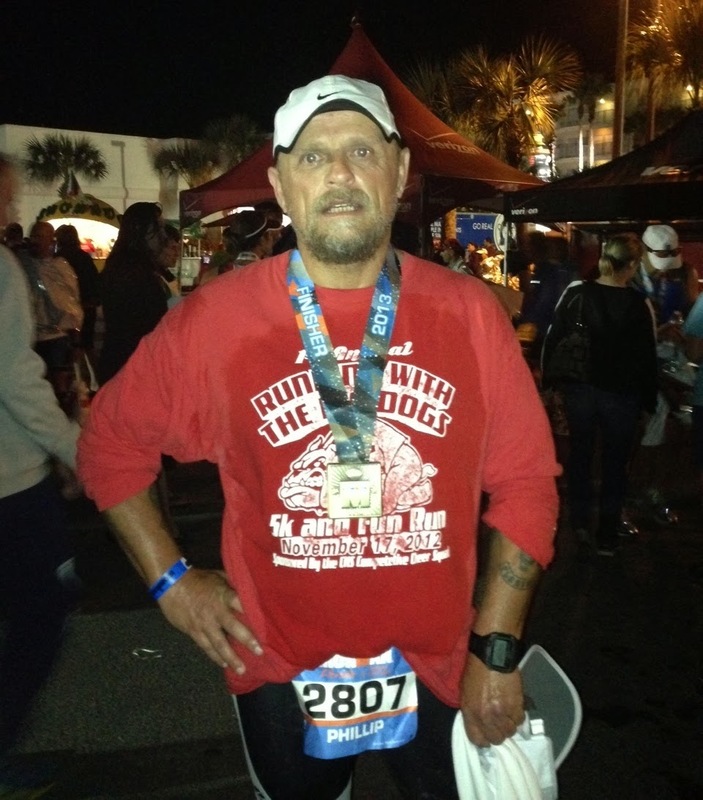 This is Philthy's second Ironman distance event. . 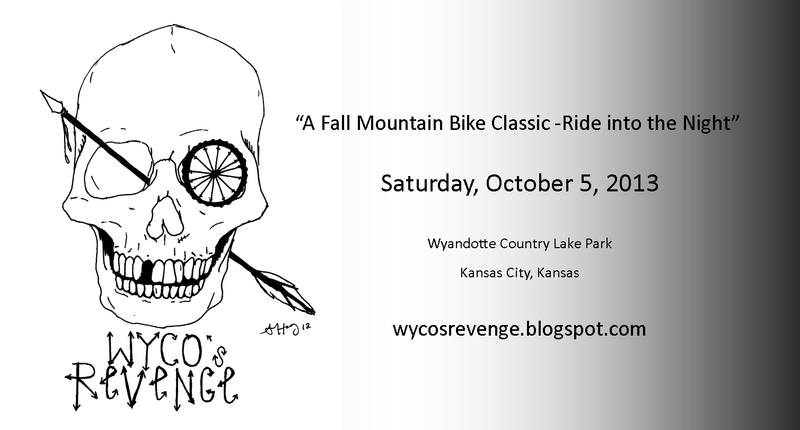 The Wyco's Revenge returns for 2013. Look for some fun new single track that has been added to this years course as well as more class options for this years event. Also added is a Chili Cook-off contest to be held and a costume contest for the Sprint Division. Registration opens on 9/11/13. Be sure to register in the first week for the discounted entry. There are currently 31 states conducting or organizing statewide sports festivals known as State Games. Modeled after the Olympic Games, State Games provide a motivational goal for all athletes within the state in which they are organized. Recreational and competitive events alike are offered in most states, so whether participants compete for the fun of it or as the first step to their Olympic dream, there's something for everybody in the State Games. 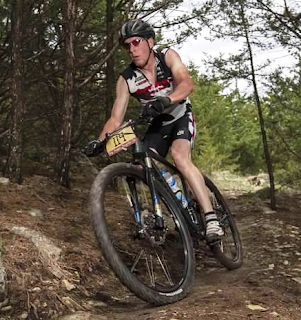 This past weekend Kansas and Missouri each held their respective mountain bike events. Great turnouts for both events with plenty of new participants at each event. How popular are the State Games? The Sunflower State Games had a record year with 9,111 participants. The Show-Me-State Games had over 30,000 participants in 40 sports. Roger Harrison was out taking more great pictures as usual - Sunflower State MTB Pictures. 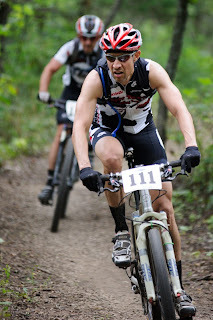 Damian Almanza looking good on his trusty 26er - the only 26er in the Expert field. A 3rd place and well deserved Bronze medal on the day for Mr. Almanza. Junior Shane Martin moved up to race with the 19-29 group. Shane had a strong ride to earn a Silver medal. Steve Brack showed great form taking the win in the Sport Cat 2 40-49 group. The Sunflower State Games added a "Fat Tire" class to this years event. 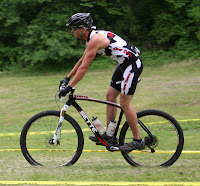 Our own Jeff Arnaud powered that beast of a bike to earn a Gold Medal taking 1st in the class. 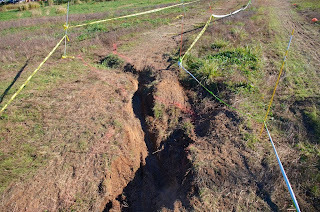 I do not think you could have asked for better conditions for the inaugural Masons Midsummer Meltdown mountain bike race. Luckily for all the temps were low enough to prevent any real meltdowns and recent rains combined with all the trail work that was put into the park showed with trail conditions near perfect. First time Race Director Cliff Jones put in a lot of hard work on this event and it showed. He surrounded himself with a great team and put on a very fine event. Cow Town Cycling was out in force and had strong showings in all classes. The Marathon class get to start out first and they also get to ride for 3+ hours. We can tell you from experience that that final hour can be trying. Doug Stone, who by the way is looking splendid in that Cow Town kit, put in some fast lap times and earned a strong 6th place in the highly competitive Marathon class. After a long two month hiatus James Maynard dusted off his rig and came and to race hard on Sunday. Result was a visit to the top place on the podium - Congratulations James on your 1st place in the Cat 3 Men 40-49 division. Shane Martin took a break from his job as a Life Guard to come out and play in the dirt. Shane only got lost once but still was able to earn a 2nd place in the Junior division. Looks like we know where Shane gets his MTB skills from. His father Donald had a great showing to earn 2nd place in the Cat 3 Men 50+ division. Way to do Martins! Sporting a cool set of jean shorts, Steve Brack settled into his new ride for a 5th place on the day. 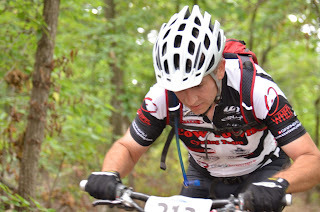 UFD Series points leader in the Cat 2 30-39 division Brad Crain made the leap forward to the Cat 1 division. Brad rode hard and earned 2nd place in his first Cat 1 race. Jenny Clark looking good in her new Cow Town kit. A strong showing today for Jenny with a 1st place in the Cat 2 Women Open class. Shane Jones rode his trusty Surly SS a 4th place finish. A flat tire on the second lap cost him a podium position for sure. 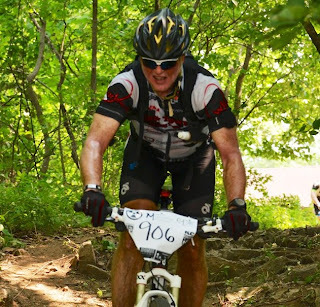 Ron Schnick returned to racing this week and had a great time out on course. 6th place on the day for Ron. 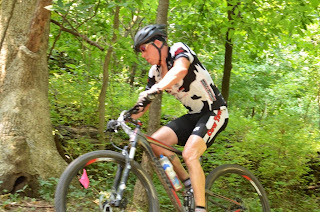 Tige Lamb overcame a first corner (first 10 feet actually :-)) mechanical to charge through the field to earn a well deserved win in the Cat 1 Men 40-49 division. 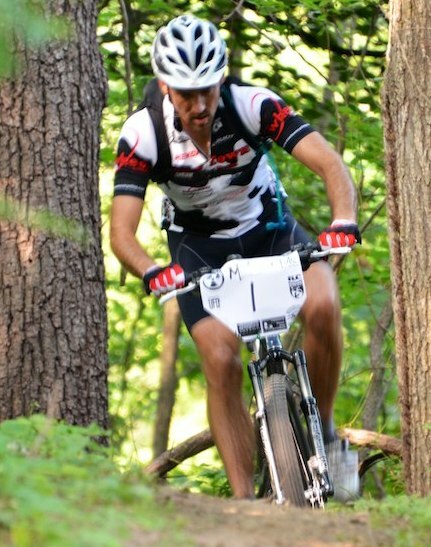 Mr President had a good ride going in the Single Speed class - leading the first hour of the race. Chris ended up replacing a derailed chain and dusting himself off after an encounter with a tree for a 2nd place finish in the Single Speed division. It is time for the off-road event of the summer. 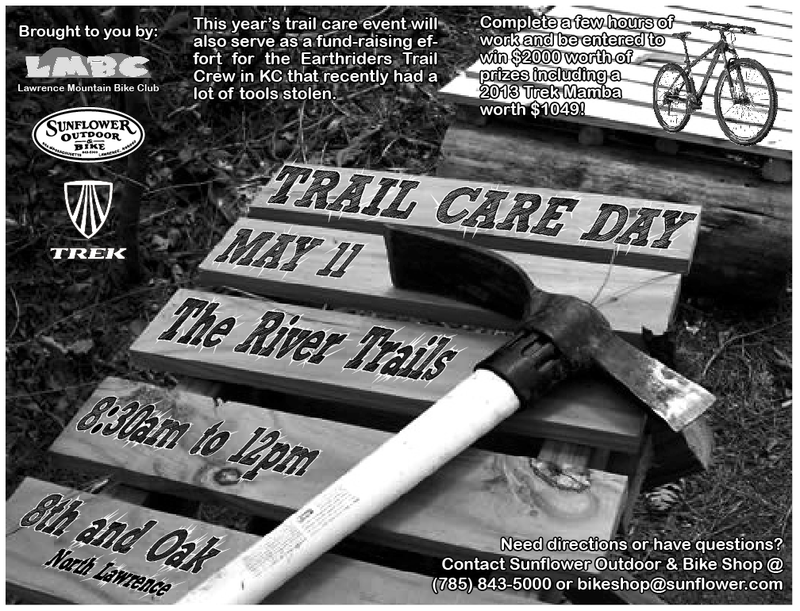 Time to air up those Fat Tire bikes and come on out on July 7th to enjoy a day of riding some sweet single track designed especially for you. Yes, it is time for the Mason's Midsummer Meltdown. 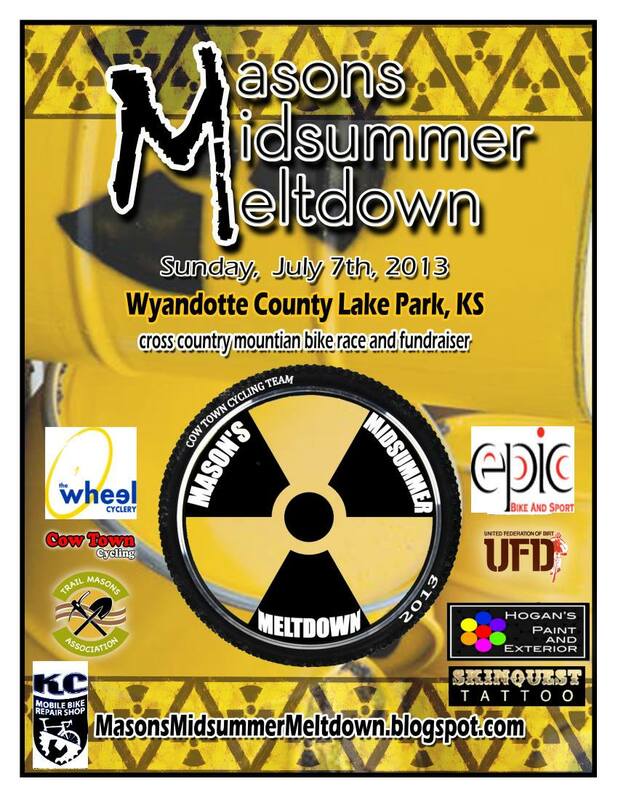 Preregister today at Masons Midsummer Meltdown Registration. 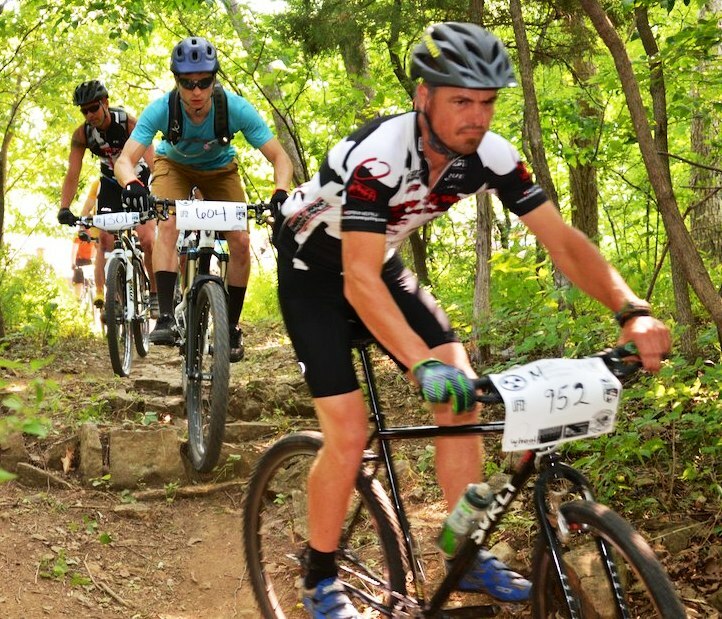 Why: Fundraiser to help build more sweet single track out at "Wyco"
Some very cool awards are up grabs along with plenty of SWAG and prizes brought to by our fine sponsors. 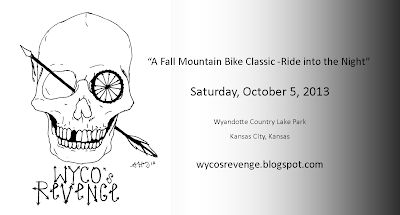 Support those who support us: The Wheel Cyclery, Epic Bike and Sport, KC Mobile Bike Repair Shop, Hogans Paint, & Skin Quest Tattoo. 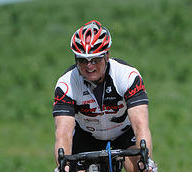 Congratulations to all who finished the Dirty Kanza this year -both the 100 and 200 mile options. 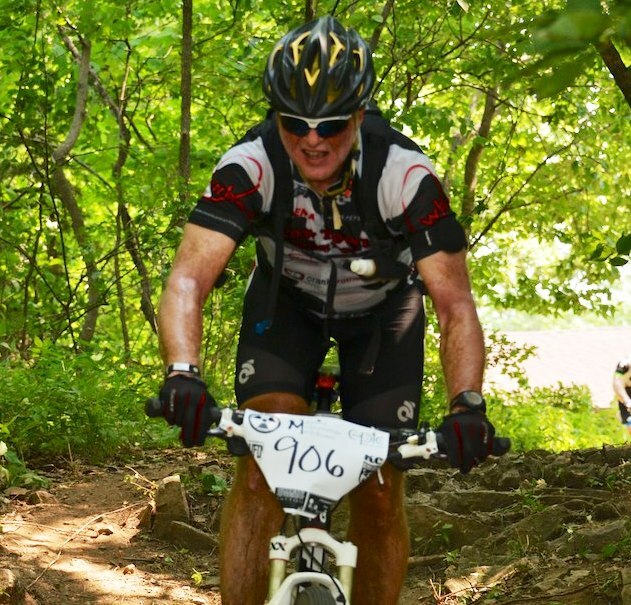 The DK 200 this year will be one for the books. It was more like one of my Wind Howler rides with 135 miles of gravel into a 15 to 20+ mph headwind. Add to that over 12,000 feet of climbing and you had a really physically punishing race. The first leg was mostly South and East with wind at your back and pretty fast. I was riding with Jason Phillips and we made the mistake of starting too far back and had to spend the better part of the first hour picking our way through the mass of slower riders. Our thought was the roads were going to be wet and muddy and we would let the mass of riders pack the mud to conserve energy. Boy were we wrong. The gravel was dry and our plan went down the tubes and forced us to work harder to get back where we needed to be. Another mistake I made was following Jason across a river on the bike instead of carrying it like everyone else. By the last leg my bottom bracket was creaking so bad it became annoying. Overall first leg gave us hopes of beating the sunset. At the first check we refueled and headed out into the wind for the remaining 3 legs. For leg 2 Jason was having trouble digesting his food from the first stop and fell behind. That left me alone to deal with wind. I jumped from group to group as the opportunities presented themselves, but I settled down and went into managing my effort and not worrying about speed. Needless to say leg 2 took allot of effort out of me. Hills we would roll down at high speed and roll up most of the following hill in the 2012 race were now pedal down the hill against the wind, then pedal the flat to the next hill and then pedal up again. I ran into Craig at this stop and we took our time refueling. 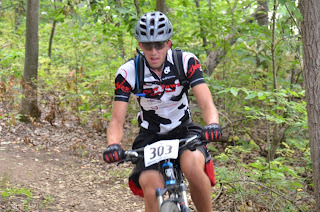 I was was waiting to see how Jason was doing and Craig getting the energy up to push the single speed out again. I would have never made it to Check 2 on a single speed, so hats off to all of those guys riding them and finsihing the race on them. Jason rolled in just I was rolling out. He was having enough trouble that he thought he was going to bail. Leg 3 was me alone again. This time the field had thinned, so really no pace lines, only individual riders. We started east, but this was to gain elevation for the turn North. The turn meant dealing with the wind. By now I was getting minor cramps every hour or so. I was following my nutrient, fluid, and salt intake plan so the cramps had to do with effort. The good thing from this exercise was that I learned how to hammer for a bit to get them to go away. This still ended up being a slow hard leg. The paved road into Check 3 was fast and my legs seemed fine now and were no longer giving me cramps. 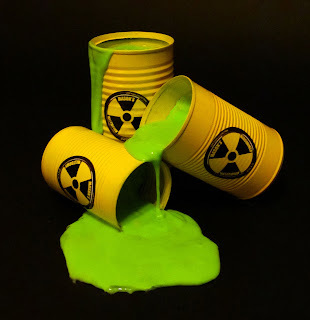 Equipment for this race is crucial. Rudy Project Magster sunglasses with Impactx Photochromic Multilaser Clear lense on the cloudy day kept everything sharp and clear vision wise. Lens even took a couple of rocks thrown at me from the rear tires of other riders with no issue. These lenses were the trick in overcast condition and into the night time ride. 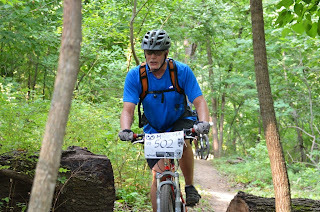 I was also sporting a Rudy Windmax helmet. Very light and comfortable for the ride. No sore neck from wearing a heavy helmet and even with light mounted on top was still light. On the bike I ran Ritchey Super Logic Evolution carbon handlebars, WCS Carbon Matrix 4 Axis stem and finally a Super Logic Carbon seat post. These all took the edge off the rough roads and enabled me to endure over 14 hours on a bike. From Crank Brothers I sported Candy 3 pedals and these worked flawlessly. Tires are critical for the DK 200 and I ran the Kenda Kommando Pro SCT tubeless. These tires rolled extremely well in all conditions on the day and I finished the race without having a flat. The Kenda Iron Cloak belt really did the trick and was the primary reason I chose this tire over the Kenda Small Block Eight with the Iron Cap. Both tires roll over gravel extremely well, but I think the Kommando will be my gravel tire with the Small Block Eight used for Cyclocross this year. Though not a sponsor, I tried Magicshine 2200 lumen ligth on the bars for the night component. Very inexpensive light and MTBR rated it as best dollar to lumen value. Not having much time with this light I paired it with my Lupine Piko 600 Lumen light I used last year. Boy is this light bright. I put it on 2200 going down the hills at high speed and had no trouble seeing. Then for the climbs I backed it down to low setting. I did that to conserve battery life, since we were going to be out over 4 hours. The Magicshine worked so well I turned off the Lupin and kept it as a backup. If you need cheap, but good lights you can't go wrong with Magicshine. The only downside is the battery is heavy and reminisant of older batteries from NiteRider. do a great job with the event. They get those Krug Park trails groomed up for us to enjoy. Thank you to everyone who made this event possible. 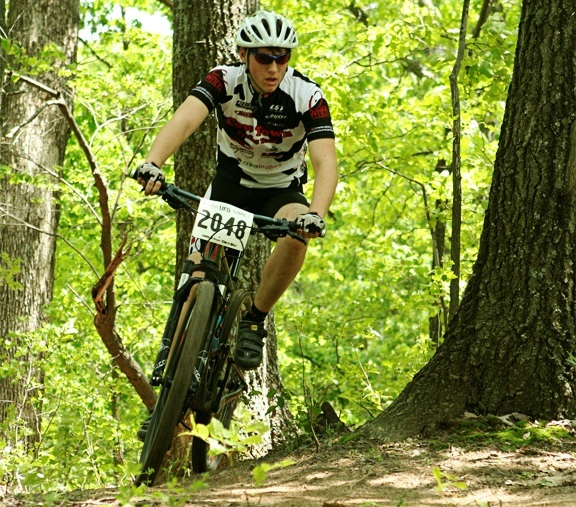 Spring is here and that means mountain bike racing is in full swing in Missouri and Kansas. Some quick race recaps below from the past 2 weekends. Then it is time to get ready for the Robiodoux Roundup this Memorial Day weekend. 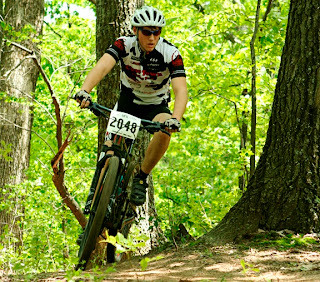 Mountain Bike state championships come early around here so you best have some form early on if you want to earn a title. Why do we have the state championships so early? Presumably to "earn" a starting spot at the Mountain Bike Nationals. The question is why does one have to qualify for nationals when other cycling disciplines do not? A question for the powers to be. On to the recaps. 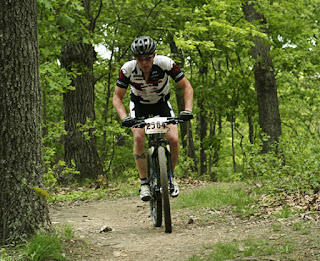 The Greensfelder Challenge was Missouri's official mountain bike championship event/qualifier. 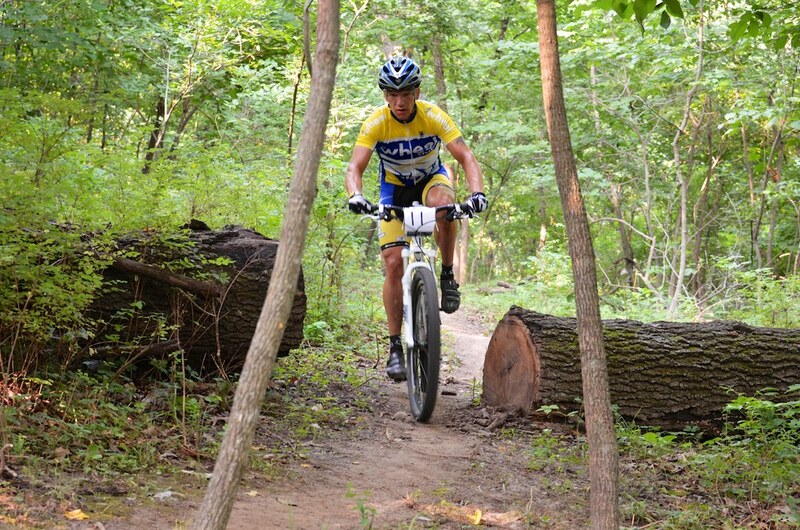 GORC have created a nice little jewel of a trail system in West St. Louis County and offered up a challenging event for all. Complete 2013 Missouri State MTB Championship Results. 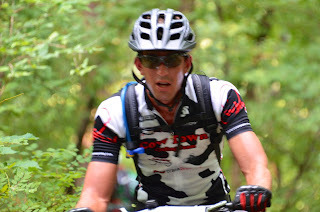 Cow Town Cycling made the trip East and was represented well at Greensfelder. Christopher Locke earned 2nd place on the day and a ticket on standby to Nationals. 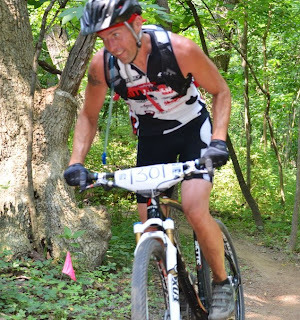 Tige Lamb rode to a strong 4th place in the highly competitive Cat 1 Male 40 - 49 division. Promoter Bob Arnold took the win so if you think promoting an event will slow you down think again. 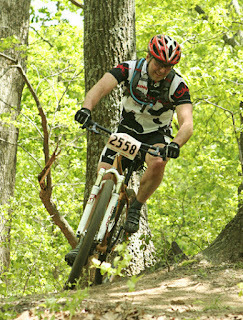 Chris Locke tested the waters in the Single Speed division on the day. Outside the top 5 on the day proves that he needs some gears for his old legs. 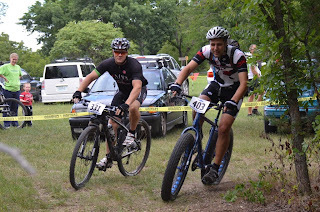 Cow Town Cycling was represented by Tige Lamb and John Wagner in the Cat 1 division. 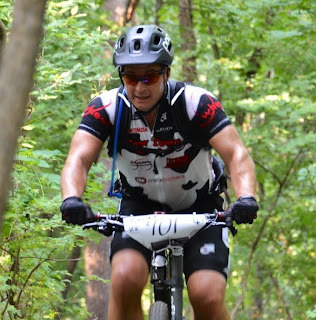 Tige "redeemed" himself and took home the State Championship in the Cat 1 Male 40 - 49 division. John rounded out the podium in 3rd. Tige in route to yet another Kansas State Championship. Wagner working hard chasing down the lead group. 3rd place Male Cat 1 40 - 49 on the day. The 3rd Annual Trail appreciation Day is here! We will work 'til Noon. Burgers or Dogs and other good stuff around 12:00. Prizes Will Be Awarded at the end of the work day. 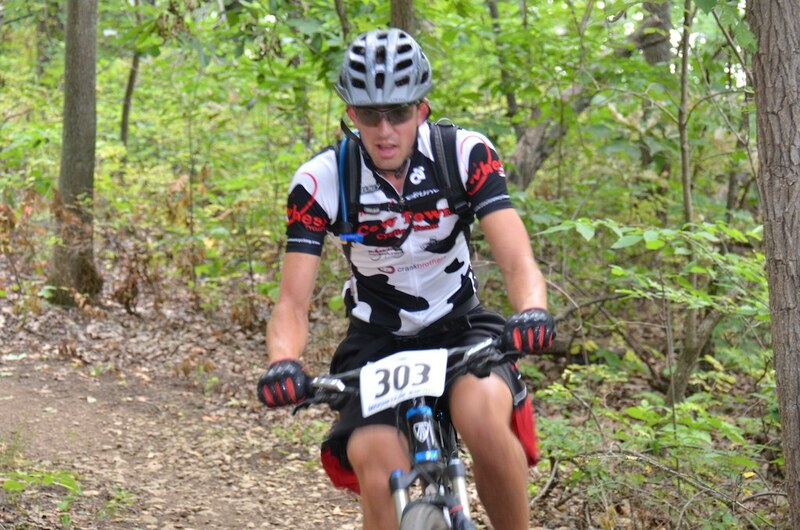 Bone Bender MTB Race is ON! 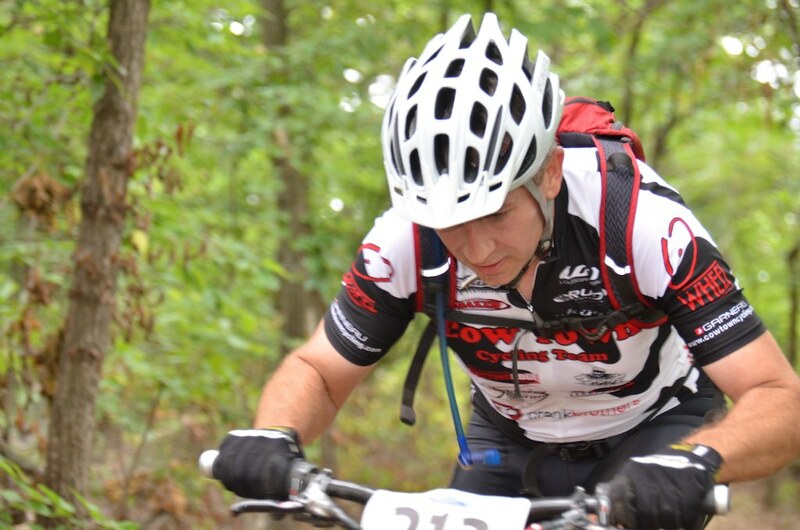 The 5th Annual Bone Bender 3/6 Hour MTB Odyssey. 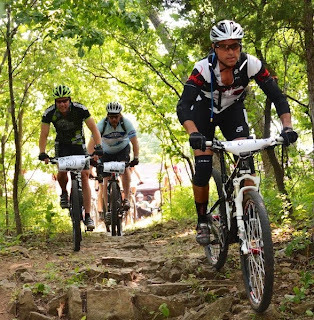 Come join off-road enthusiasts from around the Midwest as they test themselves on the North Shore Trail System and enjoy some of the sweetest and challenging trails in the Midwest. 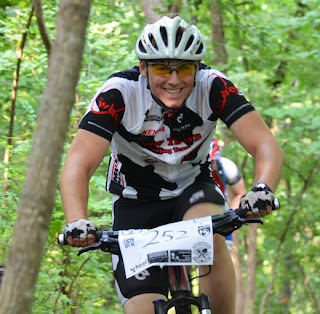 Why we do this: Sure we love riding our bikes on sweet trail systems and having a great time, but we also hold the Bone Bender each year to raise money. 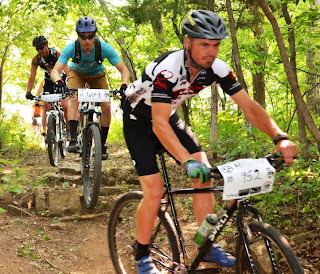 Over the last four years monies raised has gone to support organizations like the Earth Riders Trails Association (ERTA), Kansas Trails Council (KTA), Kansas Parks, Clinton Lake State park and Lawrence Mountain Bike Club. We will continue to challenge ourselves and ask that you support us by attending this year’s event so we can continue to develop and maintain trails and produce quality events for everyone to attend. Venue: Clinton State Park is a 1500 acres park located on the northeast shore of Clinton Reservoir just outside of Lawrence, Kansas and features a 23 mile hike/bike trail, 5 mile cross country ski trail, 1 mile self-guided nature trail, archery range, swim beach, sand volleyball, 2 9-hole disc golf courses, 5 acre trout pond, 1 acre children’s fishing pond, accessible shoreline use trail, fish cleaning station and 2 fish feeders, 4 playgrounds and 460 camping sites are available (240 with electric and water). Packet picket and late registration will be available below at the following times. Save $10.00 on Raceday registration fees and register at The Wheel Cyclery on one of the following days. Without our volunteers and sponsors the Bone Benders would not take place. 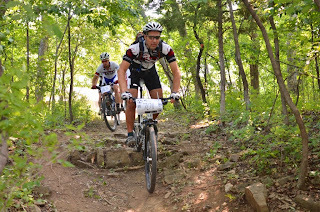 Thank you to the Kansas Trails Council and the wonderful trail crew out at Clinton Lake State park that have given us such a great place to ride. Please show your support to the following companies that support our event: The Wheel Cyclery, Paceline Products, Hammer Nutrition, Schnick Construction, Lantern Rouge Volunteer Group, Bart Cox Photography and Jewel Cartoons. Another successful God's Country Fat Tire Festival is in the books. For 11 years this event has endured setbacks and all kinds of weather including snow this year. The main reason for its success and longevity are the volunteers, support from the local cycling community and great sponsors. There are many people and groups to thank. Below is a list of the key groups, companies and people who make this event happen year after year. I huge THANK YOU! goes out to each and everyone one of you. Special Thanks to: Carolynn & Christopher Locke, Heather and Dan Jordan, Tige Lamb, Gerard Arantowicz, Roger Harrison, Art King, Cliff Jones, Jeff & Donna Arnaud, Warren Stevens, Brad Crain, Michael Mathews, Tim Greene, Dave Wathen, Craig Myers-Areth, Bob & Michael Tarne, JP Brocket and Family, Jennifer Lowe-Brewer, Tom Hall and Mark Thomas. A final Thank you to all the off-road enthusiast and participants who came out and supported our events. Round #1 of the UFD West Series is in the books. A fine event if I do not say so myself. We had participants as far away as Fargo North Dakota. The United Federation of Dirt is really growing. A huge Thank You to all the great volunteers who came out and helped. Without you this event could not have taken place. Congratulations to everyone who came out and raced. 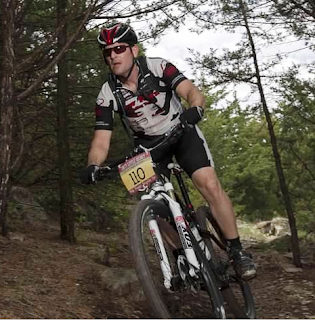 You all fought the elements and showed the true spirit of mountain biking. 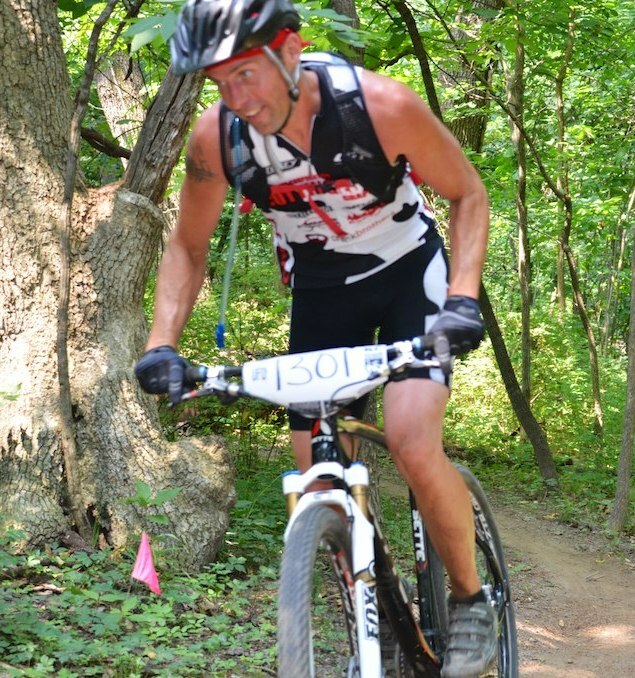 A great day for the 11th Annual God's Country Off-road Duathlon. Everyone had a good time including those fun loving Unicyclist. Results and pictures will be posted soon. 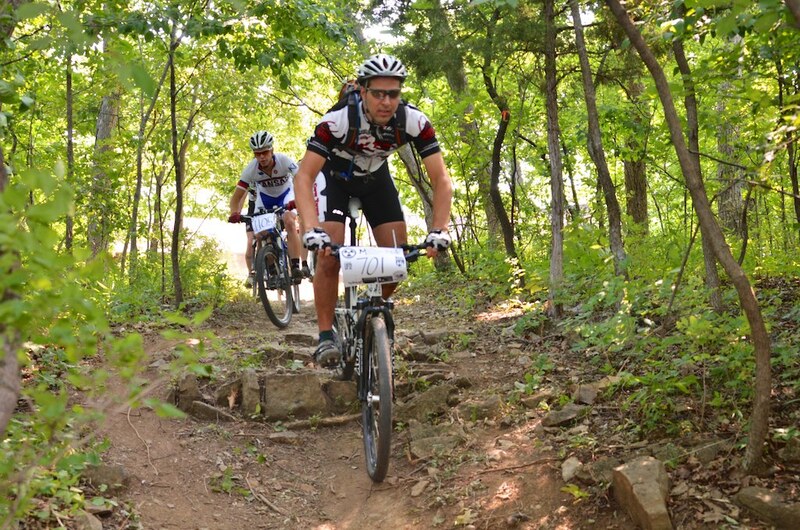 Day 2 of our festival continues tomorrow with the God's Country Mountain Bike Classic. Course conditions now are snow covered so it looks like a rare snow mountain bike race. Our 12:00 Noon class will feature Cat 1, Cat 2, Single Speed and Clydesdale. Course is all set for our first event. Current course conditions are very good and we look forward to some fun racing tomorrow morning. Raceday registration for the 11th Annual God's Country Off-road duathlon will be available and opens tomorrow (Saturday) at 7:30 am. Both Long and Short course events start at 9:00 am. 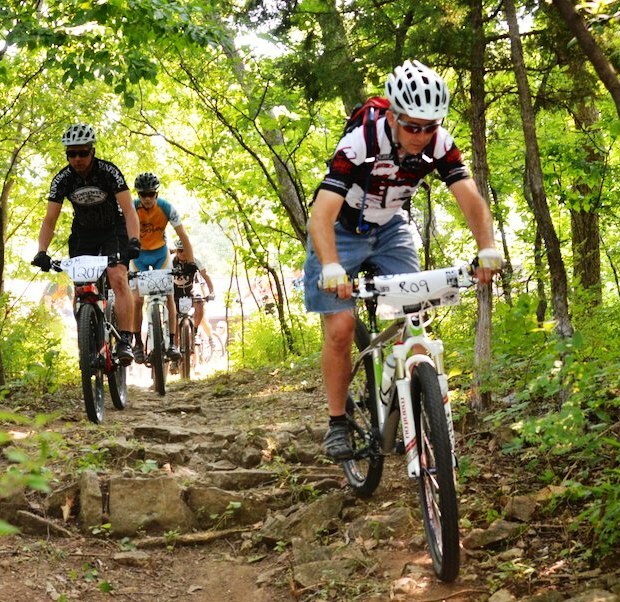 Here is a list of the classes and the preregistered riders that are entered for Sunday's God's Country Mountain Bike Classic. 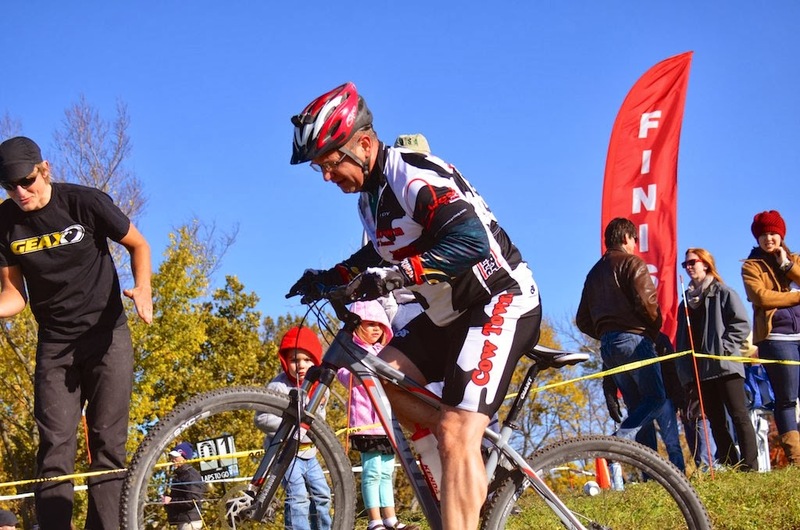 Race day registration is available and closes 20 minutes before start time. See event flyer for more info.